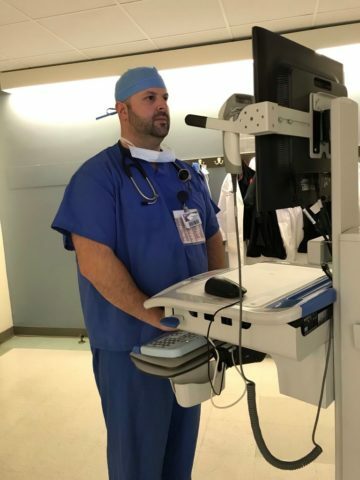 Former University of Maine offensive lineman Justin Roberts poses for a photo while working as an anesthesiologist at Rutgers University's Robert Wood Johnson Medical School in New Jersey. Justin Roberts has taken a roundabout path to a career as a physician. He did his undergraduate studies at the University of Maine, where he was an offensive lineman on the football team. After earning a degree in business, he took prerequisite courses for medical school at William Paterson University in his home state of New Jersey. Finally, he earned his medical degree in 2016 at St. George’s University School of Medicine on the island of Grenada in the West Indies. Roberts said his time at UMaine prepared him well for his journey. He said juggling academics and athletics is like having two full-time jobs. “You have to have time management skills. You have to be able to prioritize things you need to get done and do them efficiently,” Roberts said. “I loved majoring in business at Maine and I loved the university’s approach to business. I had a great path. I really enjoyed it,” Roberts said. “But as time progressed, I saw myself moving more and more toward a career in medicine,” he added. After UMaine, Roberts enrolled at William Paterson but needed a job to pay the bills. His exhausting schedule included attending school during the day and being a bouncer at a New York City lounge at night for just over a year. After applying to medical school and being rejected, he landed a job as a pharmaceutical sales rep. It wound up being a turning point in his life. So he applied to the foundations program at St. George’s and was accepted. While in Granada, he served as the president of Physicians for Human Rights. When he returned to the United States, one of his rotations was in orthopedics. He had hoped to become an orthopedic surgeon but changed his mind after participating in a surgery. His anesthesiology rotation proved illuminating. 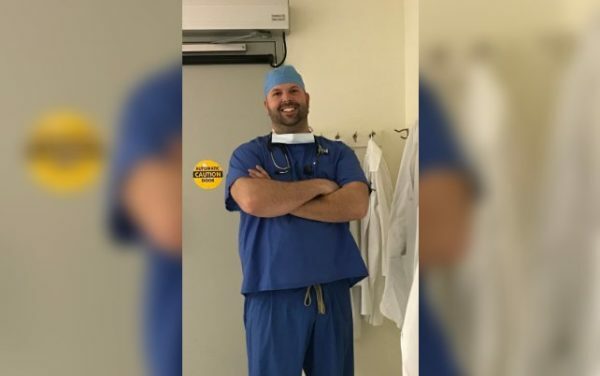 Former University of Maine offensive lineman Justin Roberts is doing his anesthesiology residency at Rutgers University's Robert Wood Johnson Medical School in New Jersey. “There was an open-heart case and there were some complications,” he recalled. “The anesthesiologist took command of the operating room. His knowledge and his ability to adapt to what needed to be done was unreal. “I told myself I need to do what that guy does for the rest of my life. I was blown away,” he said. Roberts is now doing his residency in anesthesiology at Rutgers University’s Robert Wood Johnson Medical School in New Brunswick, New Jersey. He is applying for an adult cardiothoracic anesthesiology fellowship. At UMaine, he developed lifelong friendships and special bonds. Future NFL players Mike DeVito and Matt Mulligan were among his roommates. He has stayed in contact with are Montell Owens and former head coach Jack Cosgrove, among others. “It doesn’t matter if I haven’t talked to some of these guys in a year or two. When we get together, we pick up right where we left off,” Roberts said. DeVito said Roberts was aggressive and violent on the field but a wonderful person to be around off the field. “He is one of the nicest, most kind-hearted people I’ve ever been around,” DeVito said. “He is smart and he always had his entire day mapped out. He had a very systematic approach to life. “He was the guy you wanted to be around if things weren’t going well because he would always lift you up,” DeVito added. Roberts, who had a live black bear appear on his lawn the day Cosgrove visited his New Jersey home, seemed destined to attend UMaine. Cosgrove said going up against the likes of all-conference defensive players DeVito and Matt King in practice every day benefitted all three of them. “[He was an] incredibly hard worker who always wanted to get better. Justin was a solid player for us,” Cosgrove said. Roberts’ career highlights included UMaine’s trip to the University of Nebraska in 2005 (a 25-7 loss) and the game at Boston College (a 22-0 setback) in 2006. “The Nebraska game was cool. But while we were in Nebraska, a buddy of mine sent me a photo of a moose standing in my parking space at Maine. I always wanted to see a [live] moose,” he said with a laugh. Roberts said his best memory was playing at Boston College, a game witnessed by his immediate family and his grandparents. He was elated that the 2018 UMaine team became the first in program history to reach the Football Championship Subdivision national semifinals. “I was in Chicago at a medical conference and I was watching a [playoff] game in the lobby and cheering,” said Roberts, whose 2006 team went 6-5 overall, 5-3 in the Atlantic 10. Maine will always hold a special place in his heart. The 35-year-old Roberts, his wife, Angela, and son, Ethan, who soon turns 2, vacation in Maine every year.